On this new weekly segment, “Footwear Friday,” I’m going to clue you in about different types of footwear as well as recommend some products that fall under that category. Step up your kicks game! 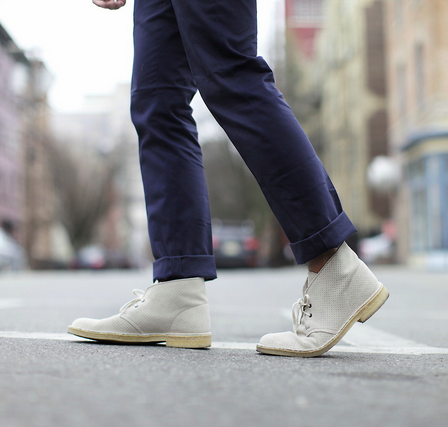 This week, I’m zoning in on the Chukka boot. One of the grail pieces of footwear, the chukka is incredibly versatile and should be a staple in any basic men’s wardrobe. They are typically made of leather or suede and are more comfortable than walking through a field of marshmallows. Historically, they were used by British military to traverse the desert with efficiency; however, modern day chukkas aren’t typically built for that utilitarian of a purpose. We wear them because of their versatility and looks. The versatility lies in their flexibility. You can dress down a pair of slacks for less formal settings, yet they’re a step above most sneakers. Pair them with cuffed jeans to become the king of casual. You’re not going to run a marathon in these, but they’re very comfortable for most regular settings. Chukkas usually come with a crepe, if not, rubber sole. Traction isn’t usually an issue and as long as you don’t drag your feet, they wear at a normal pace. As far as looks go, chukkas are primarily sold in neutral, earthy tones so they don’t clash with many colors. You can rock jeans, chinos, and any other type of long pants and distinguish yourself compared to your typical sneaker-wearing mouth breather. They’re both sleek and rugged at the same time– consider beating them up to give them “character.” A quick caveat though: be wary of wearing chukkas with shorts. I’d say they normally don’t work because they rise up too high on the ankle, but some low rise variations do exist and some people can actually pull it off. 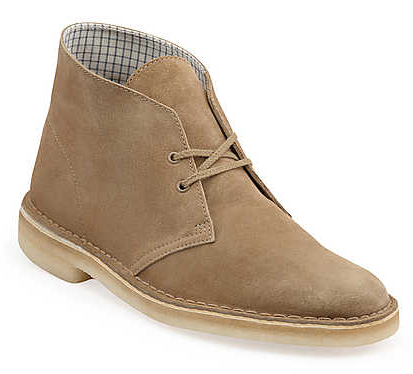 My recommendation would be the quintessential chukka, the Clark’s Desert Boot (CDB). Personally, I don’t wear many things besides the Clarks during every season besides summer. Whether you leave the house to run errands, hang with friends, or to flee the country and it’s time to choose a shoe, CDBs should always be a contender for the green light. From personal experience, the sand suede coloration goes well with almost any color of jeans and pants. Now, I would normally give you an alternative suggestion for a different price range but I recommend you don’t budge on the Clark’s. There are so many clones out there, but consider this: You can spend maybe $25-50 less on a clone of inferior quality, but they might last you a year or two of good wear at most. If taken care of properly, I’ve had accounts of Clark’s lasting 5-7 years. Mine are personally on their third year and they are still going strong. #gogetyousome! Love that first pair!! Do you know where they are from? Thanks for the follow! Hope you’re enjoying the direction of the blog. As for your question, I actually don’t know the brand of the first pair. It looks to be a canvas or suede upper layer with a crepe sole. Many brands have Clarks knockoffs so I’d suggest looking around your typical shoe stores for a similar off-white colors. Sorry I couldn’t be of more help!